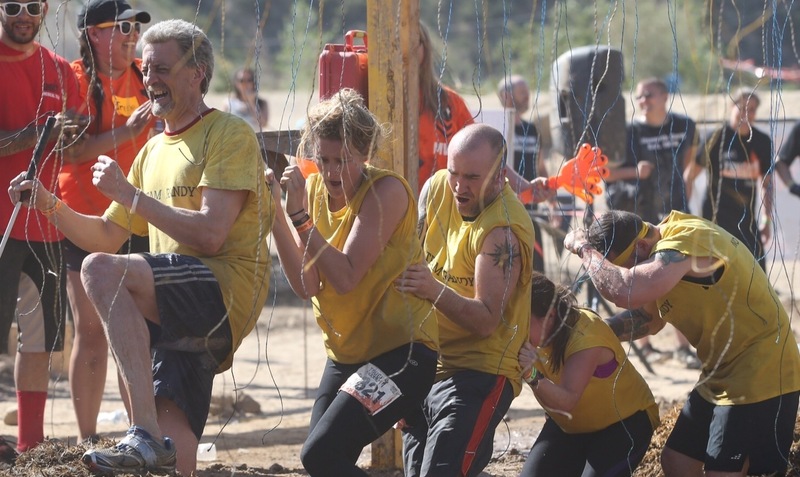 Randy and team go through a series of electric shocks in the Tough Mudder they completed in March 2015. Our adventures have often captured attention and earned us some remarkable media attention. They are, however, so very far from what we do and why we do it. Those adventures are entirely funded personally and we use the attention to hopefully draw focus to our real work. While this information and more is available for those who do explore our website, I wanted to highlight it for the readers of our blog and social media directly. I once believed everything fun or important in my life was over. I thought I could not and would not have a life worth living. I made jokes and mostly treaded through waters of denial, frustration, and even anger. This is a far distance from the person I’ve become and I never want to forget the roots of those feelings when I first transitioned to blindness at the age of 22. What made the difference for me was the right people and the right perspective. As I’ve since learned and often try to express, “Going blind is so much harder than being blind.” In fact, for any of us the first encounter with any challenge is so much more difficult than it is once we choose to plan a path for going forward. While there are countless friends and family in the fundamental part of my conversion, two organizations in particular deserve my appreciation and much of the efforts of 2020 Vision Quest. As such, we raise funds and proudly donate those funds to the NH Association for the Blind and, forever in honor of the Mighty Quinn, Guiding Eyes for the Blind. I hope through my efforts and the involvement of many to ensure the life changing services those organizations provide will always be available for the manyh who would benefit so greatly from those services. That’s the “why” behind the fundraising–and yet, still not our core mission. 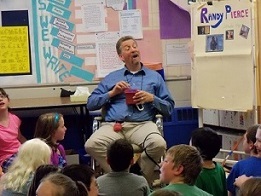 Randy speaks at Newmarket School, 2013. While it’s hard work and thousands of hours, it is also incredibly rewarding to observe the positive impact we have already had in our brief five years. There are times I’m tired from the adventures, the presentations, the organization and administration efforts and yet when I think of how high we still have yet to climb and what spectacular views await, I find it easy to reach out for this team to join together and continue our climb. I hope you’ll consider sharing this and joining the efforts in whatever way works for you.